I have to admit that last week I was a little shocked when recent-Lykos hire David Benzion showed up out of the blue at David Hilburn's fundraiser. A lot of questions flashed through my mind. Why are you here when you don't know Hilburn? Why are you here when you don't know any of the other people here either? Did you come here because you think Hilburn is a political enemy or are you just tailing Mike Anderson? And after reading all of David's responses in the comments section that came in through the evening and on into the following work hours day, I realized that perhaps I had not given David the benefit of the doubt. Perhaps after all this time, we are finally getting some transparency out of the Lykos Administration. After all, he was there to encourage people to go to the Prosecutor Reunion. Maybe he was there to answer questions openly and honestly for his new boss. So, in the spirit of goodwill, I decided to provide him with a forum to explain his side of the story. I wrote some questions here on the blog that he can answer in the comments section like he did on my last post. I'm glad that he is able to do that, and I look forward to his answers. 1. What is Lone Star Times and how long did you work there? 2. How long have you been gone from Lone Star? 3. When did you realize that you wanted to be a part of a prosecutor's office? 4. You were hired to write grants. Please explain what that means to you. 5. How many grants have you written in your three months with the D.A. 's Office? 6. What were the grants for? 7. How did Pat Lykos find out about your grant writing skills and convince you to bring those talents to the D.A. 's Office? 8. Last Wednesday, you said you were in the neighborhood of Hilburn's party to meet with Tim Fleck and Dr. Richard Murray. Are these fellow grant writers such as yourself? Was this part of your job? If so, do your time sheets reflect you going to meet with these guys? 9. Did you support Pat Lykos in the 2008 election? If not, do you support her now? And if so, why the change? 10. How many political functions have you attended on behalf of or in support of Pat Lykos since being hired by the District Attorney's Office at taxpayer expense? Once again, thanks for having the open line of communication with us here on the blog last week, David. I'm sorry that I misunderstood your intent and I look forward to hearing your answers to the above questions. Chip Lewis asked me to let all those planning to attend that tonight is NOT a fundraising event for any candidate. Additionally, all food, drinks and valet parking are complimentary, courtesy of our hosts. In case you haven't gotten the e-mail or the Facebook invitation, tomorrow night is the Harris County District Attorney's Reunion at Cyclone Anaya's located at 1710 Durham, Houston, TX 77007 (***PLEASE NOTE: This is the Cyclone Anaya on Durham, NOT the one at Midtown). The event is hosted by Chip Lewis, Bert Graham, and Paul Doyle and runs between 5:00 p.m. to 7:00 p.m. And yes, Mike Anderson will be there. He is a former prosecutor, as you may have heard. It has been a while since there has been a prosecutors' reunion, and the last one was an absolute blast. So many legends of the Criminal Law world were in attendance. It really is an incredible opportunity to sit back and hear stories from past generations of prosecutors. All current and former prosecutors are invited to attend, although it is understandable if prosecutors who currently get their paychecks signed by She Who Must Not Be Named are a little gun shy about attending. Unfortunately, their concerns about being seen at such an event are not baseless. Also inexplicably in attendance was David Benzion, who showed up and then left within five minutes. I'm not really sure why he was there. He seemed a bit surprised to see me when I saw him in the parking lot. The moral of the story is simple, unfortunately. If you are out at an event and you are worried that Lykos might learn you were there . . .
You should be. Somebody is keeping tabs. There is a fundraising event tonight for our friend, former-prosecutor in Harris and Brazos County, and man-about-town, David Hilburn, who is running for District Attorney up in Brazos County. I don't expect this posting to be of too much interest to the non-CJC folks who read this blog, but David was an immensely popular prosecutor during his time in Harris County and I know all of his old friends will be excited to see him. The event is hosted by Paul Doyle and Brent Mayr and is at the Junction Bar and Grill, located at 160 W. Gray Street, Houston, TX 77019 and runs between 5:00 p.m. and 7:30 p.m. I hope you all can make it. I'm trying to pick up the pace on the Chronicle blog a little bit. I just published this article on why Lykos should resign. It has come to our attention that several notable supporters of District Attorney candidate Mike Anderson have stated that they will not support District Attorney Pat Lykos if she wins her re-nomination bid in the upcoming Republican Primary Election. TCR is disgusted by this "I'm taking my marbles and going home" attitude. We believe that there is nothing wrong with a robust primary process, provided that Republicans unite behind our Republican nominees against the Democrats. TCR calls on Mike Anderson to ask his supporters to do the right thing and pledge to support the eventual Republican nominee, not the Democrat. If the Anderson supporters still refuse, then Mike Anderson should demonstrate his commitment to our Republican candidates and publicly reject the support of this politically disloyal minority--surely he doesn't need their "marbles" that badly. It has come to our attention that over the past four years, several of our customers have complained that the Lykos Platter served here at Polland & Woodfill's Country Kitchen has given them nausea, diarrhea and, in some cases, death. We strongly encourage you to please keep eating the Lykos Platter and try the new Shadwick Salad and the Summerlin Soufflet, as well, no matter how bad it may become. We are aware that many of you have recently come to try the Anderson Dinner that popped up on the menu against our wishes. Damn democracy. Many of you are ordering the Anderson Dinner because it is healthy and does not give you indigestion. We are doing all we can to take it off the menu as quickly as possible because we believe that a healthy and qualified meal can only exist as part of an illegal and politically motivated campaign against the Lykos Platter. Unfortunately, we have recently learned that many of our customers have said that they will not eat our nausea and diarrhea-inducing Lykos Platter under any circumstances, even once if we take the Anderson Dinner off of the menu. Some are even threatening to try something from the Fertitta chain of restaurants in the event we offer you nothing but the Lykos Platter. As customers of Polland & Woodfill's Country Kitchen, we find these types of threats to be against our best interests, and we call upon all fans of the Anderson Dinner to disavow them. If they won't, we call upon the Chef of the Anderson Dinner, Mike Anderson, to disavow them. Otherwise, he clearly hates food! In short, we here at Polland & Woodfill's Country Kitchen are committed to giving you food that will continue to make you sick, and you will LIKE it. Here's an idea: Why don't you write a post on your blog explaining why exactly it is that you think a highly controversial incumbent District Attorney who has led the Office to the point of being the target of multiple criminal investigations, while alienating the major police agencies, decimating office morale, and generally not having a clue is a better candidate for the Republican Party than a highly respected former prosecutor, judge, and natural leader who used to win elections by the highest margins in the county. Has the Republican Party under your and Jared Woodfill's leadership really gotten so far astray that qualifications truly don't matter anymore? Mike Anderson is a true leader that the Republican Party should be jumping up and down about having on the top of the Criminal Justice ticket. He can give a speech with heart and energize people to do the right thing. The reason he can do that is because he's a good and honest man who has been in the trenches and can lead from the front. If you and Woodfill and Pat Lykos were truly interested in the best interest of the Republican Party, you would be encouraging Lykos to withdraw at this point. The only person bringing down the Party's reputation is her. None of you will do that, of course, because you don't care about the Party. You only care about yourselves. You ask your readers to be loyal to a Party that you aren't loyal to yourself. In case you might not have put it on your calendar, please remember that tomorrow, February 18th is the fundraiser for the Michael Barrow Fund. It being held at the Grove Park located at 33 Waugh Drive between 2 p.m. and 6 p.m. Thanks to the hard work and generosity of a lot of members of our Harris County Criminal Justice Center Community, this event has jumped from being just a run-of-the-mill fundraiser to a true event to celebrate the life of a great attorney and friend. There have been extremely generous donations from too many people to list here for items on the silent auction that are amazing. You can bid on everything from rounds of golf at exclusive courses around the county, Rockets tickets, a week stay in Playa del Carmen, a catered crawfish boil, artwork, wine, time at a timeshare in Vail, a duck hunt and much much more. And the biggest prize to the highest bidder is the opportunity to use a Tazer on Robb Fickman. I'm not kidding. So, if you thought this was going to be just a small, somber occasion where the winner of a raffle got to search for a prize carefully hidden in Dupont's beard, think again. This is going to be an amazing event. I know the weather is going to be bad, but please stop by if you can. It is going to be a fantastic event. And it goes without saying, how proud I am to work with such great people who have given so much to help out. As the old saying goes, there is no rest for the wicked . . . The Houston Chronicle is reporting tonight that Pat Lykos is about to be the recipient of the Office's fourth special prosecutor since October. The Texas Rangers have asked Judge Belinda Hill to appoint a Special Prosecutor to assist them in their investigation of the Harris County District Attorney's Office. Now, as we all know from events of the past two weeks, the Rangers had been investigating Lykos' Office for several days before Lykos sent them a letter asking them to investigate her and tell the public that it was her idea. Given Lykos' penchant for "recycling" (taking an already existing good idea and claiming it for her own), this should not have been a shock to anyone. In the three years that we have all come to know and love Pat Lykos as District Attorney, she has now claimed to have initiated the Victim Witness Division, the Cold Case Division (twice) and now, an investigation into herself. Nevertheless, poor Pat was still caught off guard and had to storm out of her own press conference when asked about the Rangers' investigation. I mean, come on, Pat! If you are going to launch an investigation into yourself you really should anticipate questions about it during a press conference about yourself. The question now is, what exactly are the Rangers investigating and what was on the computers that they took out of Special Crimes on Tuesday? 1) Special Crimes has its own little world on the 5th Floor. They are the Navy SEALS of the District Attorney's Office, right down to the special technology. When the Rangers started hauling stuff out of Special Crimes, they weren't taking information from the entire Office's computer servers (like an e-mail search akin to the one that brought down Chuck Rosenthal). They were taking Special Crimes equipment -- the type of equipment generally used for surveillance. 2) From Patricia Pollard's letter condemning the District Attorney's Office, we know that there are allegations the District Attorney's Office performed some sort of surveillance in an effort to either stonewall or intimidate the Grand Jurors. These allegations are what led Lykos to make her statement stating there had not been an "investigation" into the jurors. 3) There have been rumors running rampant that the Grand Jury room was bugged. As much as I dislike Pat Lykos and think that she and her upper-echelons are about as sleazy and underhanded as they come, I cannot imagine that she would be stupid enough to actually place illegal wiretaps within the Grand Jury room. I mean, she's dumb, but she's not that dumb. 4) The latest rumors that I am hearing, however, do sound a little more plausible to me as something that Pat Lykos and the Gang Who Couldn't Shoot Straight would do. The rumors are that Lykos and the upper echelon witnesses who were called into the 185th District Court Grand Jury miked themselves up before testifying. (a) The proceedings of the grand jury shall be secret. (b) A grand juror, bailiff, interpreter, stenographer or person operating an electronic recording device, or person preparing a typewritten transcription of a stenographic or electronic recording who discloses anything transpiring before the grand jury, regardless of whether the thing transpiring is recorded, in the course of the official duties of the grand jury shall be liable to a fine as for contempt of the court, not exceeding five hundred dollars, imprisonment not exceeding thirty days , or both such fine and imprisonment. So, if Lykos is proclaiming that she didn't commit a crime, I suppose she's right -- as long as you don't consider contempt of court a crime. If you are a student of Lykos' "B.S. Your Way through a Crisis" Game, it should be pretty easy to see where she and her Crew will be going with this. "Neither I nor any member of my office have committed any crimes. Given the nature of this politically motivated Grand Jury committing an improper and illegal investigation into this office, we sought to protect ourselves by taping the proceedings for our own records." And if Judge Susan Brown holds them in contempt (as mandated by the Code of Criminal Procedure), guess what Lykos and Crew will do then? Claim that is politically motivated as well, of course.
. . . information collected by the court, court personnel, or prosecuting attorney during the grand jury selection process about a person who serves as a grand juror, including the person's home addres, home telephone number, social security number, driver's license number, and other personal information, is confidential and may not be disclosed by the court, court personnel, or prosecuting attorney. So, even if Chief Investigator Don McWilliams didn't consider what he was doing to be an "investigation," he certainly was looking into information that his Office was prohibited from having since they had been recused from the 185th's investigation. I am home today with what feels like the flu. Looks like there are big doins down at the CJC with Texas Rangers seizing computers out Special Crimes. Y'all feel free to discuss amongst yourselves. GUEST POST: The Difference Between "Tough" and "Just Plain Mean"
How ironic it was to see the Ibarra brothers on Channel 13 commenting about how it feels to be investigated for investigating. It was the Ibarras' federal lawsuit which indirectly drew in the Harris County DA's Office and ultimately lead to Rosenthal's emails, destroying his career. De ja vu all over again? Before she took to dodging and ducking from Ted Oberg (thanks, Ted) and Wayne Dolcefino (thanks, Wayne), Pat Lykos was a compulsive camera seeker. Two of her favorite platitudes were, "We live in the 3rd largest metropolitan areas of the United States, ladies and gentleman ...."- a pointless comment, except to remind herself and everyone else of the vastness of her kingdom; and, "They (they being anyone who disagrees with her, criticizes her, refuses to endorse her, those who investigate her or run against her) don't like me because I'm tough..."
She still uses these lines, but more rarely now and in smaller, selective campaign venues where she is willing to show her face, surrounded by her traveling posse which includes Rachel Palmer. In fact, during one of her staged media statements good old Ted Oberg asked her something to the effect of, what have you done about Rachel Palmer? Her reply was dismissive, but she felt compelled to say that she hadn't even spoken to Rachel Palmer. LIE: Rachel had been with her the night before at a campaign event. Mean is defined as "worthy of little regard: contemptible; characterized by petty selfishness or malice, causing trouble or bother: vexatious." Let us review known facts about Pat Lykos and consider whether each indicates toughness? or meanness? 1. Most judges hire only one or maybe two court coordinators. Pat Lykos had to hire scores of them because she treated them like dirt, they were afraid of her, and they would quit. I can't recall any of their names because we really never got to know any of them. It would be interesting to interview a few of them. Not tough, MEAN. 2. Judge Pat Lykos also failed to maintain a consistent staff from the District Clerk's Office and is notoriously prone to banning prosecutors from her court room. Not tough, MEAN. 4. Fast forward to 2011, the year of Amanda Culbertson. We all know what happened. Culbertson voiced concerns about BAT Van test results, and whether or not Culbertson was correct the DA's office and Pat Lykos personally decided to keep this information secret and continued to prosecute defendants without disclosing the fact that witness Culbertson had questions about test results. Criminal or not, the DA's Office remains G U I L T Y of Brady/ethics violations to this day for not disclosing an expert witness's concerns to the defense immediately. The violation remains, regardless of whether in the end Culbertson was wrong. On top of all this, did Lykos and her inner circle stop there? Hell no. Lykos/Rachel Palmer made the additional effort to persuade HCSO to join them in recommending to Commissioner's Court for the first time ever that the Lone Star College Contract (where Culbertson was employed) with Harris County for 20 years be cancelled, thereby causing Culbertson to lose her job. Now Lykos will say that DPS, (the "premier law enforcement agency in Texas" as she put it, who is ironically investigating Lykos at this time and may very well get her indicted) was a better financial deal for Harris County. Whatever, it remains clear that the motivation was to retaliate against Culbertson just like having all the pro-Kelly for DA supporters fired from teaching at the HPD Academy ( see #3 above.) Not tough, MEAN. 4. Another of Pat Lykos' endeavors upon taking office as DA was to attempt to prohibit prosecutors from running for judge. The operations manual was re-written with a tone similar to a veiled threat issued to anyone who might desire to run for office. She even invited visiting Judge Mike Anderson to her office for lunch and discussed this ludicrous concept with him and even flirted with the notion that Mike Anderson might become some sort of adviser to the DA's office so that his affiliation with her might lessen the chances that he would ever decide to run against her. Thank God he declined. Much to her chagrin, those darned Federal laws prohibited her from stopping prosecutors from seeking judicial office. Tough, no. MEAN, yes. 5. As DA, Pat Lykos, an award-winning public official acknowledged by organizations such as the Innnocence Project for her successful pandering to get public attention any and every way possible, has dumped the long-standing philosophy of all former DA's in Harris County that if a police officer is intentionally killed in the line of duty, the DA's Office will seek the death penalty, period, and the DA himself or herself will be lead prosecutor on the case. No wonder the police unions are against you, Pat. You have no respect for the rank and file of law enforcement, whether they be patrol officers working the nightshift or your own hard-working baby prosecutors or even the lowest file clerk in your office. They are beneath your consideration. It is NOT TOUGH to let murderers of police officers experience the criminal justice system without at least TRYING to obtain the ultimate punishment allowable by Texas Law. Insensitive and mean, yes. 6. Another situation which provides insight into whether Pat Lykos is really tough or just mean is the Mark Donnelly and Rifi Newaaz incident. The newly-elected DA, still riding high on her accomplishment of becoming DA and looking for any camera she could find to get in front of, took an opportunity to make a front page example out of two of the most respected and honorable prosecutors she had working for her in the office. Without bothering to (a) talk to Mark or Rifi herself, (b) or talking to the Judge in the case, Pat Lykos decided to call a press conference and report to the media that because her prosecutors lost a Batson challenge during jury selection, she acted swiftly to demote them and to give them days off without pay. It turns out that Donnelly and Newaz really hadn't violated Batson; the judge just granted the defense's motion 'out of an abundance of caution,' and assigned no malice to either of the prosecutors for the way they exercised their strikes on potential jurors. Lykos later privately approached Donnelly to let him know she may have overreacted but refused to retract her statements to the press about him, refused to reverse his demotion, and refused to give him the pay he lost. Not surprisingly, he left after finding a job at the US Attorney's Office. During that hiring process, Lykos contacted the US Attorney's Office and tried to convince them not to hire Mark Donnelly. Am I noticing a retaliatory pattern? HPD Academy instructors fired, Culbertson loses her job, and she also does this to Mark? Not tough, mobster mentality MEANNESS, Pat. 7. Shirley Cornelius, career prosecutor and mother of a special needs son. The DA's Office under Pat Lykos has earned a federal lawsuit as reward for its treatment of Shirley Cornelius. She was transferred to obscure assignments and pressured to falsify her time sheet and was told she could not work her 8 hour day in a time frame consistent with the needs of her son. Shirley resigned because of MEANNESS, not toughness. 8. Pat Lykos has turned the appellate division into the Island of Misfit Toys. Once the most prestigious appellate division anywhere in the United States, the administration has whittled this most important department down to a mere shell of its former self, and today Alan Curry and a few leftover brilliant others are pulling an enormous work load to absorb the two non-producers hiding out there, drawing huge salaries while knowing nothing about appellate law and doing nothing but either running her own political campaign for judge (Lana Shadwick) or laying low hoping not to be fired under pressure by the public's outrage for taking the 5th in front of a grand jury ( peek- aboo, we see you Rachel Palmer!) You should be ashamed for so many things, Pat Lykos, and high among them is for your absolute lack of concern for the people who work hard to make those hard-earned convictions stick and who work every day to keep your office in line with the law. MEAN. 9. And ditto #8 above, as to your trial bureau prosecutors. While you enlarge your own office, replace carpets with hardwoods and make the 6th floor conference room a high tech media stage; while you hire highly paid Public Information Officers, Community Outreach representatives, Lobbyists for the legislative sessions all of whom conduct dubious taxpayer business at best and are suspected of working primarily on your re-election campaign; while you give away money such as $500K to HPD as a media stunt to placate the BAT van situation, you have hundreds of prosecutors who have not received a pay raise in years, some of them never. You do not care to realize how hard these people work to make your operation function and make you look like you know what's really going on when you don't. They work after 5, before 8 am and on holidays and weekends to handle staggering numbers of cases. You do not realize how many of them are just trying to get to year 8 so they can vest in retirement and then QUIT. They resent you and they know you don't care. Look at it this way, if they quit and the DA's office never convicts anyone, you can just close down appellate all together because there won't be any appeals. Think of the money you'll have to waste somewhere else. Your maltreatment of the work-horse prosecutors, the back bone of your operation is no indication of your toughness, just meanness. 10. Most recently, you have dragged your entire office through a harrowing grand jury investigation. You constantly preach of this 'politically motivated conspiracy.' Yet that so -called conspiracy resulted in no indictment, when we all know that grand jury could have easily issued multiple indictments if it had wanted to do so maliciously. Seems like the process worked in your favor, so please shut up about the political conspiracy because there is not one. But you apparently can't shut up, as evidenced by your decision to come out of hiding and read a statement on 1/31 because you could not resist repeating your conspiracy mantra. It backfired because Ted Oberg was finally able to ask you questions again, questions you weren't ready for. And you lied, and you looked like a liar and you got caught at it. Call it what you want, but by your own admissions taxpayer resources, equipment, and work time were used by you for your own political purposes--to stalk andd intimidate and follow and harass grand jurors, investigate their backgrounds and those of the judge, special prosecutors, and your opponent. You are Richard Nixon. No wonder lots of people do not like you or have any respect for you or your arrogant Chicago mobster mentality. Official Opression, Retaliation, Conspiracy, Public Corruption, Misuse of Taxpayer Resources = YOU. What about that other grand jury investigating you? Explain how THAT is politically motivated, since you never seem to address this in your propaganda. The 263rd grand jury was empanelled from a random jury pool. And we have yet to learn what will come from that contempt hearing. You sent your people after transcripts AFTER being ordered by a judge and a court of appeals to stay out of the grand jury proceedings. Judge Brown should consider additional contempt show cause hearings based upon the DA's offices own admission that it used grand jurors' names and personal information for political purposes AFTER you sealed those names. Thank goodness you cannot touch me, but on behalf of those silently trying to continue to work at the DA's Office despite the fact that you are bringing down the walls around them, the truth is going to come out and when it does the law and the voters are going to hold you responsible for every MEAN thing you have done. The D.A. 's Office Requests DPS to Investigate . . .
. . . the D.A. 's Office. As if all the investigations and counter-investigations that have gone on over the past several months weren't enough, DPS has issued an official statement that today they were asked by the Harris County District Attorney's Office to investigate the Harris County District Attorney's Office. Now, in all honesty, I'm not really sure what to make of this. Weren't the Texas Rangers and the FBI already investigating the D.A. 's Office? If so, isn't requesting them to investigate today kind of akin to inviting someone into your house after they've already come in three days ago? Or did Lykos finally realize the hypocrisy of all her "transparency" blather in light of all the stonewalling and investigating they did during the 185th Grand Jury investigation? Or did the people behind the 185th Grand Jury/Mike Anderson conspiracy just convince Pat Lykos to initiate a politically motivated investigation into herself? The reality is that Lykos probably took all week to confirm that none of her investigators ran TCIC/NCIC background checks on any of the Grand Jurors, Jim Mount, Stephen St. Martin, Judges Marc and Susan Brown or Judge Mike Anderson or Devon Anderson. Once they were certain that nothing was going to turn up, they invited the Rangers in to confirm it and give them a Seal of Approval. Once again, it is worth pointing out how unnecessary all of this is. ME: I'm going to need to get you some clothes for trial. What size pants do you wear? HIM: My waist is 34. ME: What length for the pants? ME: Well, how tall are you? ME: Really? You look shorter from this side of the plexiglass. HIM: Yeah, and you look like you got a lot more hair from this side, too. Tune in for tonight's Reasonable Doubt with me and Todd Dupont. Our guest will be Defense Attorney and the Democratic Candidate for Harris County District Attorney Zack Fertitta. We are excited about having Zack on and hearing about what he has to say. As always, you can tune in at 8 p.m. on Houston Media Access, or watch it live streaming by clicking here. As you all know, Michael Barrow passed away last week and his family could use some help during this very sad time. There is a fundraiser being held on Saturday, February 18th between 2 p.m. and 6 p.m. at the Grove Park located at 33 Waugh Drive. I hope you will come and share your memories and help out the family of this wonderful man. I'm suddenly hearing from multiple sources that the Texas Rangers have begun an investigation into the Harris County District Attorney's Office and have begun interviewing people. 4:35 p.m. - Channel 13 is now reporting that the Texas Rangers and the Federal bureau of Investigation are interviewing people at the Harris County District Attorney's Office. Click here for more info and tune into Ted Oberg at 5:00 p.m. to catch his report. As some of you may have noticed, I de-linked from Big Jolly's blog yesterday. It wasn't an easy choice to do so, but one that I ultimately believed had to be done. I have no problem printing contrary opinions to my own and I link to several websites that I have a different outlook on Criminal Justice than the author does. But Big Jolly jumped the shark the past couple of days, and I just don't feel right about linking to him anymore. I like Dave Jennings as a person, but he has become so grossly misinformed about what is going on around the CJC that I just can't put a link up there that might imply I find his information even intellectually honest. Back in November, when Rachel Palmer was whooping and hollering about pleading the 5th and recusing Judge Brown, the District Attorney's Office took time out of its busy (and budget-strapped) schedule to hire David Benzion as a media spokesperson. It was a savvy political move by Pat Lykos. After all, Benzion had been the editor of Lone Star Times, an influential Republican website in Harris County politics. By hiring Benzion with our taxpayer dollars, Lykos could claim that it was a needed position in the Office and hopefully scoop up all of Lone Star Times' followers as well. I don't know if Lykos was able to scoop up all of Benzion's followers, but she damn sure seems to have scooped up Big Jolly. You see, Big Jolly used to work with Benzion at Lone Star Times. As a matter of fact, when Benzion shut down the Lone Star Times website, he encouraged his readers to get their Republican Reading needs fulfilled by going and checking out Big Jolly's blog. These guys are friends and there is nothing wrong about that. At least there is nothing wrong about that until Big Jolly ends up becoming a shill for Pat Lykos via David Benzion and doesn't think we are smart enough to notice it. Benzion's first day at the Harris County District Attorney's Office was on Monday, December 19th, 2011 -- right when Rachel's Motion to Recuse hearing was going on. Keep in mind that during this period of time, Lykos was hiding from the media. The normally attention-hungry District Attorney simply could not be found. She was dodging every media outlet that she possibly could. Those who even have the faintest familiarity with Lykos know that her dodging the media is a gross deviation in her character. Can't say that I blame her. The media wanted to know the answer to the pesky question of "How exactly do you keep employing a prosecutor who just invoked the 5th Amendment in front of the Grand Jury?" Lykos had no answer to that quiz, so she didn't show up anywhere that she would have to answer it. Seriously. That was the title of it. I guess the title of "Pat Lykos: Super Awesomest District Attorney in the History of District Attorneys is Eradicating Villainy and Providing All Harris County with Safety and Looking Very Lovely While Doing It" would have been a little too over the top. And then Dave jumped in with his conspiracy theories and political motivations for the 185th. I tried to talk to him, and we had polite conversations. But he just kept on coming with it. A self-serving District Attorney who allows a 5th Amendment-taking-prosecutor to remain on the job is just fine and dandy, but suddenly a volunteer citizen who serves as a Grand Jury foreperson is treated like the Anti-Christ? Do you have any idea how much crap was made from allegations and innuendo about Patricia Pollard because of the mere fact that she was serving as the foreperson of a Grand Jury?! That poor lady signed up to serve on a Grand Jury along with 11 other citizens back in August and the next thing you know, our elected District Attorney is portraying her to be the second coming of Lee Harvey Oswald. Mrs. Pollard hadn't even said a thing and the Grand Jury hadn't issued a single finding; yet the Gang Who Couldn't Shoot Straight was going after her like she was John Gotti. And there was Dave Jennings calling it like Lykos saw it. The conspiracy theories surrounding the 185th Grand Jury became so ridiculous that I don't even know where to begin. I honestly don't know what the Grand Jurors could have done to appease the conspiracy-minded Dave Jennings short of setting themselves aflame in front of the CJC. Even when they issued no indictments, they still got blasted and insulted for issuing a First-Amendment-protected-letter saying they felt the D.A. 's Office had attempted to intimidate them. In his dramatically entitled post "Harris County DA Lykos stands up to Runaway Grand Jury," Big Jolly called Mrs. Pollard a "Wyatt Earp wannabe" and then cleverly refers to her as "Mrs. Earp" through the remainder of the post. Dave ridiculed a respected volunteer serving as Grand Jury foreperson for doing the job she was entrusted to do because she had the audacity to question Lykos' intimidation tactics. It just gets worse from there. The thing that just kills me about the way Big Jolly writes these stories for Lykos is that he isn't just excusing Lykos' behavior, he's commending it. Today, he even implicated Bert Graham! Seriously, Dave. Have you ever even met Bert? 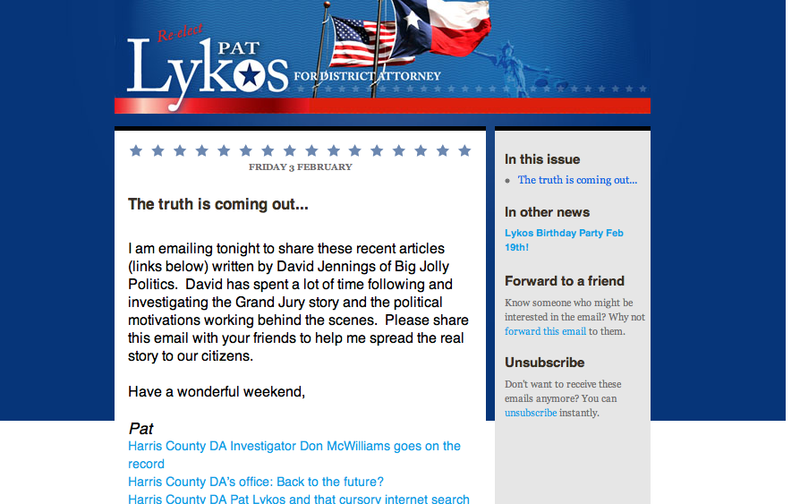 It troubles me greatly that Big Jolly believes the joining of people who believe that Pat Lykos is a terrible (if not criminal) District Attorney must be a huge political conspiracy based on speculation. Since when did having common sense become participation in a conspiracy? The reason I unlinked from David Jennings' (AKA Big Jolly) blog is that I found it to no longer be credible or trustworthy. A blog that condones the malicious attacks on ADAs by half-wits like Don Hooper while praising the Mafia-esque tactics of Pat Lykos is just not one that I care to affiliate my blog with anymore. The slamming of good people's names because they dared to investigate Lykos didn't really do much for me either. But what really and truly bothers me is that Big Jolly's affiliation with Lone Star Times and David Benzion, coupled with his sudden unprecedented access to Lykos (for the purposes of writing fawning articles) sure makes it look like Big Jolly has become a shill. Remember, I don't sell advertising on this blog. Perhaps I'm wrong. 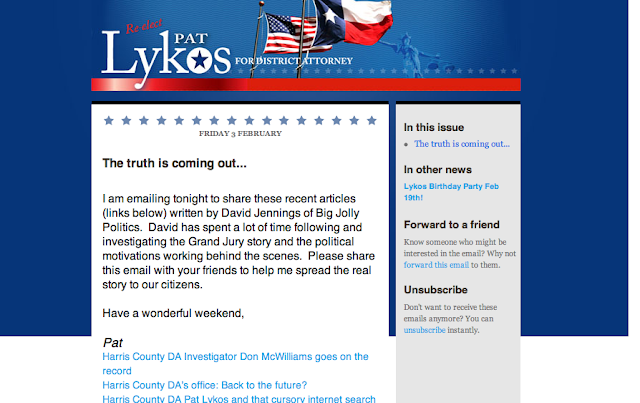 Maybe Dave really does think that Pat Lykos is the "most awesomest" District Attorney ever and none of this really was a conspiracy on behalf of her Administration to use taxpayer money to write campaign pieces for her. You know how crazy people can get with their conspiracy theories. Brian Rogers and the Chronicle finally jumped on board and started following the story of Pat Lykos investigating the members of the 185th Grand Jury with this article. As usual, the Chronicle has given it a soft sell -- the linking caption on their home page points out that Lykos merely "used the web" to look into the Grand Jurors, and they also put David Jennings' blog defending Lykos on their home page, as well. Ted Oberg had a good follow up to last night's story with this one from tonight. I do have to point out that since Channel 13 now apparently has the Ibarra brothers as legal commentators, I understand why Channel Two settled for Wice. (Just kidding, Brian.) In all seriousness, Oberg once again is able to get at what is of real concern and that is Chief Investigator Don McWilliams' use of Accurint. I wasn't all that familiar with the use of Accurint until today. Fortunately, Mark Bennett has done a very good piece explaining how it works. Check it out by clicking here. I've gotten several comments over the past three days regarding a website that was recently established that contains numerous false and libelous accusations about me. From a legal standpoint, I cannot do anything that assists in the dissemination of that material and that means that I cannot and will not publish any comments that link to it, either. I can only say that the material in it was absolutely false. As a rule, I will publish any comment regardless of whether or not I agree with it, but I won't publish something that I know to be false or invasive into the private lives of anyone. I am not trying to limit anyone's ability to speak freely, but there are some parameters that have to be followed. Okay, so I'm sitting at home on the couch with my jaw hanging wide open after just watching Ted Oberg's six o'clock report on Pat Lykos' latest antics. I mean, I know that no one is going to ever accuse me of being President of the Lykos Fan Club, but Oberg's story tonight falls under the "Holy Cr*p" category regardless of your feelings of Lykos. The long story short is that despite Lykos' triumphant "Hey I didn't get indicted!" press conference yesterday, where she denied investigating the 185th Grand Jurors, she, in fact did. On SATURDAY, October 22nd, First Assistant Jim Leitner called Chief Investigator Don McWilliams at home and ordered him to run all the background information he could on the Grand Jurors. On SATURDAY, October 29th, that investigation expanded into researching not only the Grand Jurors, but also Judges Marc and Susan Brown, and Judge Mike Anderson. Lykos' response is that this is not an investigation. I guess that would depend on what your definition of "is" is, wouldn't it? Or something like that. If any other Defendant or subject of an investigation was caught researching the men and women of a sitting Grand Jury or Jury, would there be a cause for concern or at least an air of potential retaliation in the works? What exactly differentiates that type of behavior when the District Attorney is the one doing it as opposed to a "common criminal"?